Dolly, says your a big jokester, and will do anything to make her laugh. What is the biggest joke you've ever done, to make her laugh. 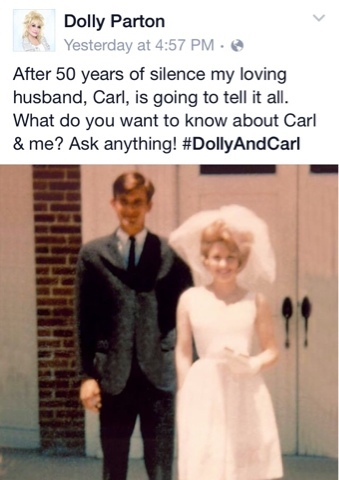 Carl I don't know hoe you have managed being hid all of these years. It is great that you let Dolly do what she needed to do to fill her career. A spouse is only as good as the person behind them and you have been a great supporter for your wife and that is a blessing to her and because of that she could be the person that she was and if. I would like to say thank you for being the way that you are and God Bless you. Is Dolly a neat freak or messy? Is she part tomboy underneath all that femininity? I know she's talented and all that, but I've wondered about that since I was a kid.